Elkhart Lake, Wisc. (August 1, 2017) – Covered with handprints of young cancer patients from Children’s of Alabama, the No. 24 Kelly Moss Road and Race (KMR) Porsche GT3 entry will be back in action this weekend at Road America with driver Jake Eidson looking to grow his IMSA Porsche GT3 Cup Challenge USA by Yokohama championship advantage. Eidson, 22, who hails from Littleton, Colorado, has found himself inspired by the cancer patients he has met at Children’s of Alabama. 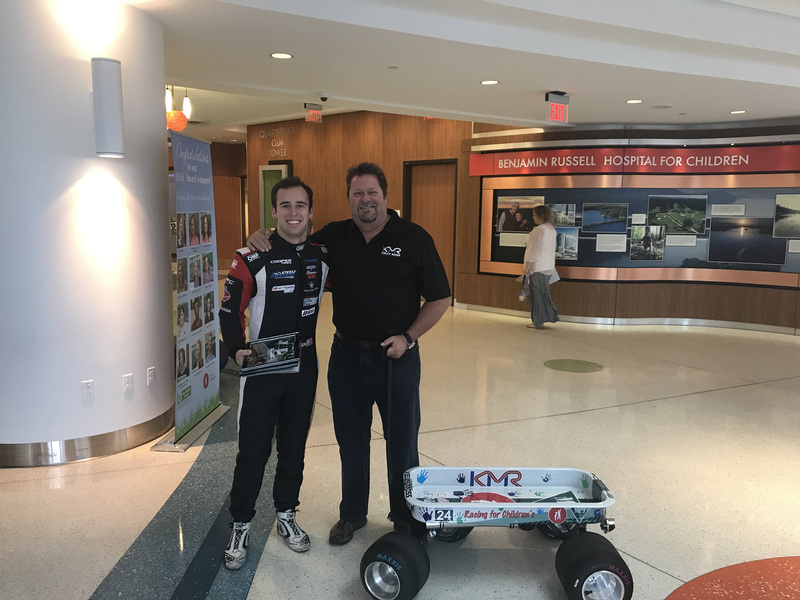 The young American driver won the first-ever IMSA Hurley Haywood Scholarship ahead of the 2017 season, and will once again proudly carry sponsorship from Medical Properties Trust to benefit the Alabama Center for Childhood Cancer and Blood Disorders at Children’s of Alabama. Eidson, who began his racing career in go-karts at the age of 11, is enjoying a career-best year so far. He recalled seeing cancer patients from Children’s who came out to Barber Motorsports Park in April to cheer him on during the races, which inspired him “to do my job, to focus on the race and to try and get the best result for them” – which he did, winning both races. “The kids are kind of like our new good luck charm and we need to have them come out to more races,” he added. Thanks to continuing support for Racing for Children’s by Medical Properties Trust, the Children’s of Alabama logo and the handprints from young cancer patients at Children’s will remain on the car through the remainder of the IMSA Porsche GT3 Cup Championship Series season. 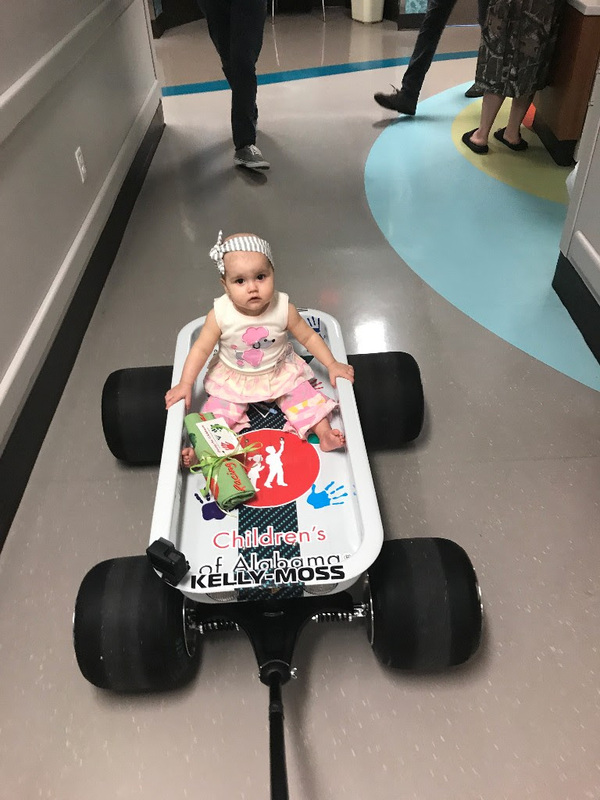 Kelly-Moss team owner Jeff Stone also was inspired by what he found at Children’s of Alabama. 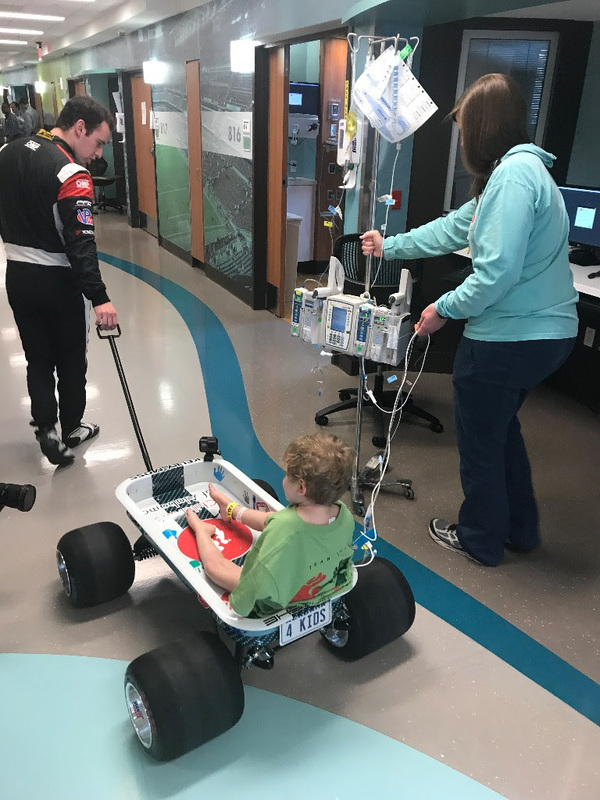 Stone was so impressed with Children’s of Alabama when he first visited the hospital in April (to help reveal the racecar with all the kids’ handprints) that he wanted to give something back. Patterned after the distinctive Racing for Children’s racecar itself, the wagon bears the logos of Children’s of Alabama and MPT as well as colorful handprints of individual cancer patients and the number 24 – the number of the car that Jake is driving in the GT3 Cup Series. Now in its seventh year, Racing for Children’s has raised more than $1 million to support the Alabama Center for Childhood Cancer and Blood Disorders, along with other Children’s initiatives. 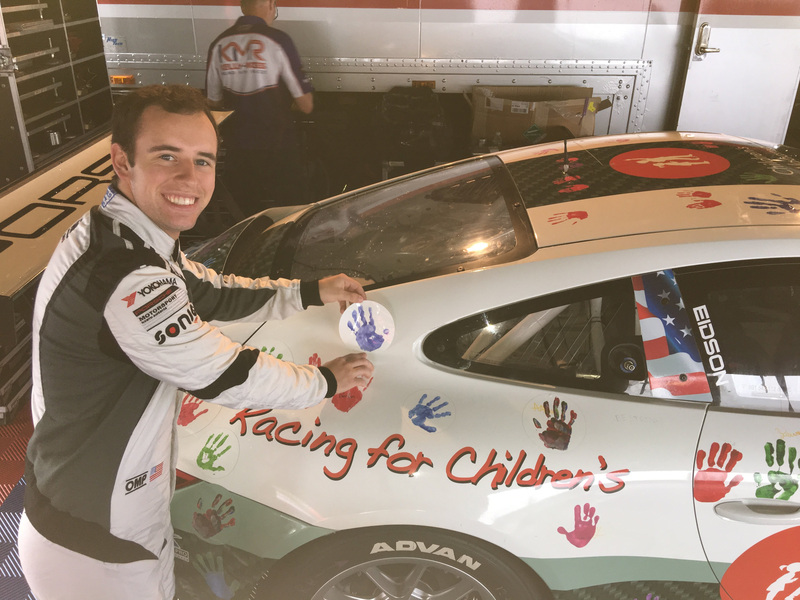 The distinctive Racing for Children’s racecar, which is covered with the colorful handprints of young cancer patients from Children’s, is also helping to increase awareness about pediatric cancer and the hope for cures. Please consider supporting this worthy cause by sponsoring a child’s handprint for $100 or donating any other amount – so these kids can leave cancer and other debilitating diseases in the dust. Every dollar raised goes directly to the Alabama Center for Childhood Cancer and Blood Disorders, and other initiatives at Children’s of Alabama. Encourage your family and friends to consider contributing as well by sending them this link: http://www.racingforchildrens.org. 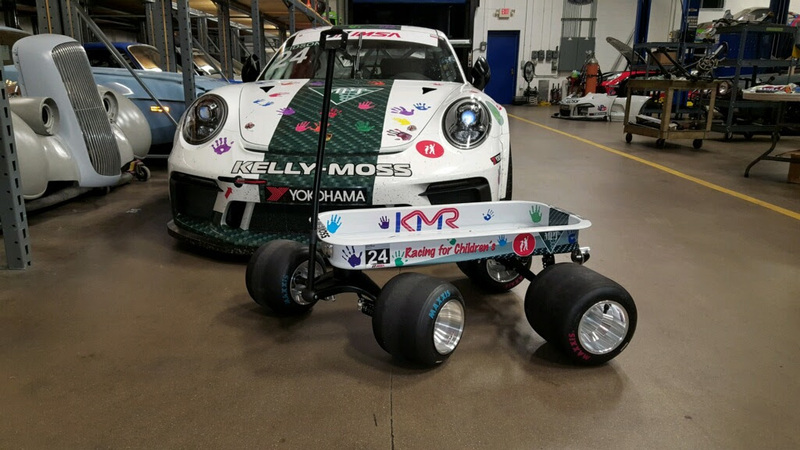 Racecar Driver Jake Eidson and the 2017 “Racing for Children’s” Porsche 991 GT3 from Kelly-Moss Racing that he is driving in the IMSA GT3 Cup Challenge at Road America this weekend. Born May 24, 1995, Jake Eidson hails from Littleton, CO. After a successful karting career that began when he was 11, Eidson (pronounced EDD-sun) attended Skip Barber Racing School in 2010 and claimed Rookie-of-the-Year honors plus four Skip Barber competition championships (Winter and Summer) from 2011 to 2013. Those strong results helped him earn a Team USA Scholarship to compete in the Formula Ford Festival and Walter Hayes Trophy events in England in 2013. In the Festival, he finished fifth out of 50 entries; and in the Hayes Trophy, he finished seventh out of 110 entries. In 2014, he came in third overall in the USF2000 Championship, moving up to second place the following year. At Road America in the 2016 IMSA Porsche GT3 Cup Challenge USA by Yokohama, he finished an impressive second overall behind series champion Jesse Lazare. In January 2017, he was awarded the inaugural Hurley Haywood GT3 Cup Scholarship from the International Motor Sports Association (IMSA) and joined the Kelly-Moss racing team. In March, during the IMSA races at Sebring, he finished second in round one and claimed the top podium spot in round two. 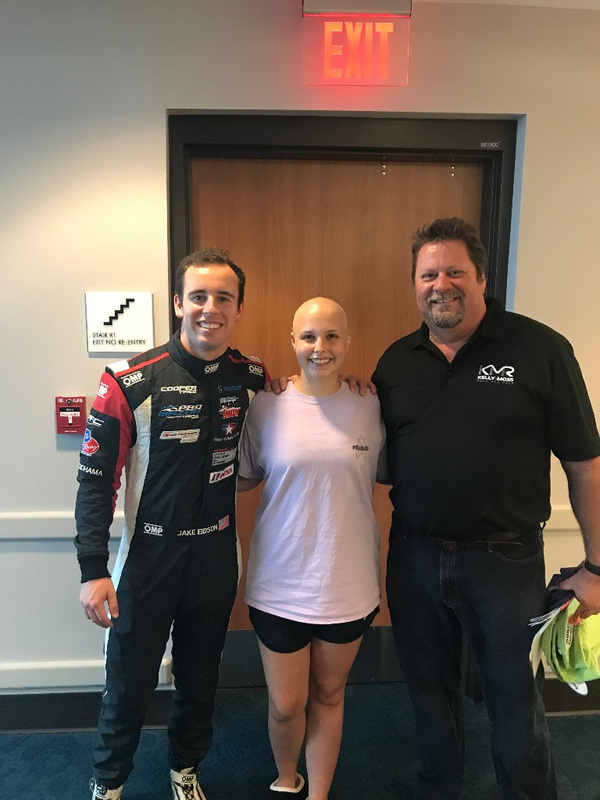 Invited to drive the Racing for Children’s car in the IMSA Porsche GT3 Cup Challenge races at Barber Motorsports Park in April to help raise awareness and funds to cure childhood cancer, Jake earned the first two podium finishes ever for the cause, finishing first in both races. Following his stellar performance at Barber’s, Jake finished forth and then third in the two IMSA GT3 Cup races at the Circuit of the Americas in Austin, TX. After getting hit in the first turn of the first race, he masterfully managed to control an almost uncontrollable car, finishing a respectable fourth. In the second race, he did even better – achieving a third-place podium finish and earning more points in this year’s championship standings. And at Watkins Glen, Jake did well again. He won the pole and was leading in the first IMSA GT3 Cup race on June 30th until a major wreck occurred behind him and ultimately resulted in the first race being cancelled. In the second race the next day, Jake finished first among American GT3 Cup racers and second overall, which enabled him to maintain his lead in the championship points standings. Eidson became a part of Racing for Children’s at the recommendation of Haywood, who today serves as the chief driving instructor for the Porsche Sport Driving School at Barber Motorsports Park and is recognized as one of the most accomplished sports car endurance racers in history.